There are few functions on your computer that are more important than the ability to back up and recover your precious data and functions. With all the attacks that a computer faces while surfing the internet makes this ability of the utmost of importance. Most manufacture’s built in backup and recovery systems do a nice job of this, but an advanced backup and recovery system such as Norton Ghost takes this step to another level. How does Norton Ghost Work? This sophisticated backup and recovery software initially creates an ISO image that is then transferred and written to a CD or any other portable storage device. This makes it very convenient to protect such stored information on your computer as important documents, photos, music, videos, or any other type of data on your computer that you wish to store externally for recovery purposes. When you experience a malfunction with your computer you can then use the externally stored information to recover lost files or easily restore your computer to a previous normal working state. It has a very simple wizard and point and click user interface which allows for making the backup and recovery task very easy and convenient. It has a backup scheduler that allows you to make recovery disks at times that you are not using the computer yourself, so it does not slow you down when you need to use the computer. This included disk imaging software is designed to be able to restore a computer even if you are doing this from a remote location. 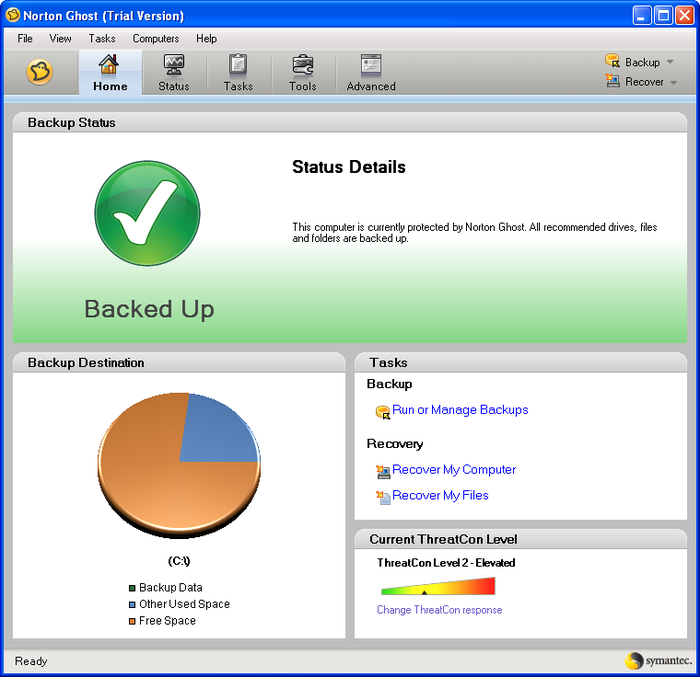 It creates backups that take into consideration your computers current security level. It comes with a lot of good features already installed and ready for use. Newer versions can create images from the boot disk also. The recovery portion of the software program requires a whopping 1GB of memory and is an extremely slow process. You must have the serial number and activation code from the original purchase in order to use the recovery function from a backup disk. The software does not have any capability to make, format, or delete the important partitions on your computer hard drive(s). It is a commercially sold product that adds expense to your budget; there are similar programs available for free. Product updates and support were discontinued on April 30, 2013. When you take all this information into consideration it makes Norton Ghost a worthwhile software purchase for your computer when it comes to the very important backup and recovery of your computers data.